Home > 2017 > DARTSLIVE > A Pair of DARTSLIVE OFFICIAL PLAYERS, Muramatsu and Noge to be listed in Guinness World Records(TM)! Nippon Darts Festival 2017 ended successfully. 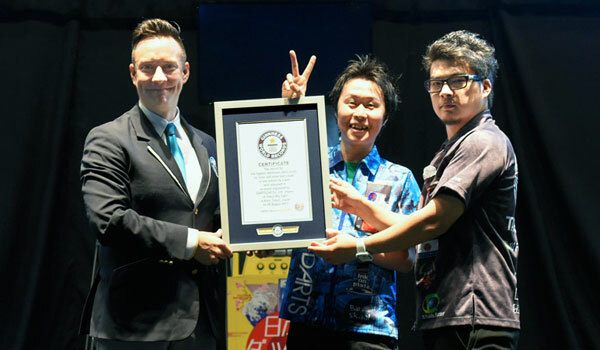 During the 2-day event, Guinness World Records challenge was one of the main attractions on the second day (Sun Aug 20)! The participants were 3 pairs of DARTSLIVE OFFICIAL PLAYERS: Sho Katsumi and Yuji Eguchi, Haruki Muramatsu and Shunpei Noge, and Paul Lim and Kenichi Ajiki. They attempted to set the world record of “Highest electronic darts score by inner and outer bull's-eyes in one minute by a pair”. Each pair had kept hitting BULL for a minute. Out of the 3 pairs, the pair of Muramatsu and Noge set the world record and their achievement was recognized by Guinness World Records. In the award ceremony, the pair received the audience's heartfelt applause. Congratulations to Haruki Muramatsu and Shunpei Noge!